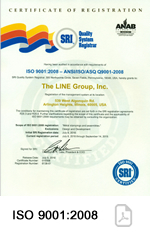 Quality is a way of life at The LINE Group, continuously monitored and upheld by our entire organization. 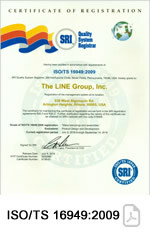 We are certified to both the ISO 9001:2008 and TS 16949:2009 quality standards. Various software and reporting formats are available, as appropriate, according to customer requirements including first article reports and PPAP's. We perform the highest quality control standards of measuring and monitoring the processes, enabling us to satisfy the most stringent requirements and standards. We are dedicated to total customer satisfaction. Systems of continuous improvement permeate all facets of our operation, from the President to the Receptionist. Regarding inspection, the process occurs at all levels of the manufacturing process. Constant monitoring of incoming raw materials, first article samples, work in process and finished goods is performed on a consistent and constant basis. We firmly believe, however, that quality cannot be inspected into the product; it must be incorporated into the process. Quality must originate from the design and engineering phase and must be maintained by the processes and the people performing the work. To that end, engineering, quality assurance and manufacturing work hand in hand on an in depth review of prints, procedures, process, tolerance and manufacturability. Statistical Process Control procedures are utilized to identify critical parameters and to closely monitor the process to prevent problems before they occur. At The LINE Group, our ultimate goal is zero defects. World Class Quality is the result. Compliance with applicable EPA and OSHA regulations. In depth review of prints, procedures, process, tolerance and manufacturability. Ultimate goal is zero defects.